In this file photo, Army veteran Cody Rice hits the field as a member of the Wounded Warrior Amputee Softball team. Local Army veteran Cody Rice and his wife Shanna have been chosen as the recipients of a new home, thanks to the 501(c)3 nonprofit Homes For Our Troops, an organization dedicated to building and donating specially adapted custom homes for severely injured post-September 11 veterans. In August 2012, while serving in Afghanistan, Rice stepped on an explosive device which resulted in the amputation of his right foot as well as a traumatic brain injury. In a video provided by Homes For Our Troops, Rice said that the organization has presented him with one of the greatest opportunities of his life: they will build him a new home which will be constructed in Penn Valley, and will grant Rice the space and adaptivity to move about his house with very few limitations. The Rices are currently living with Shanna’s parents in a two-story home which creates obstacles and challenges for Rice. The space doesn’t allow him to use his wheelchair often, and the small bathroom makes it hard for him to maneuver himself as needed. Rice learned of Homes For Our Troops while recuperating in Walter Reed National Military Medical Center. He was amazed that an organization existed exclusively for helping veterans in his situation. Teresa Verity is the marketing associate for Homes For Our Troops, and said that her organization has built homes for 270 veterans in 42 states, and currently have about 80 projects in progress across the nation. The criteria for being considered a recipient of a dwelling from Homes For Our Troops is specific. To qualify, one must have been injured in the theater of the Iraq-Afghanistan war, post September 11, 2001, retired or in the process of retiring from military service, received a letter of eligibility for the Veterans Administration’s Specially Adapted Housing program, plus pass a criminal and credit background check. Additionally, the Homes For Our Troops dwelling must serve as the recipient’s primary residence. Veterans must also accept the responsibility of home ownership and have the resources to maintain a home, including basic maintenance and upkeep, property taxes, home insurance, and utilities. “We have land for Cody’s home, but are still looking for a builder in the area,” said Verity, asking that those seriously interested contact Homes For Our Troops. 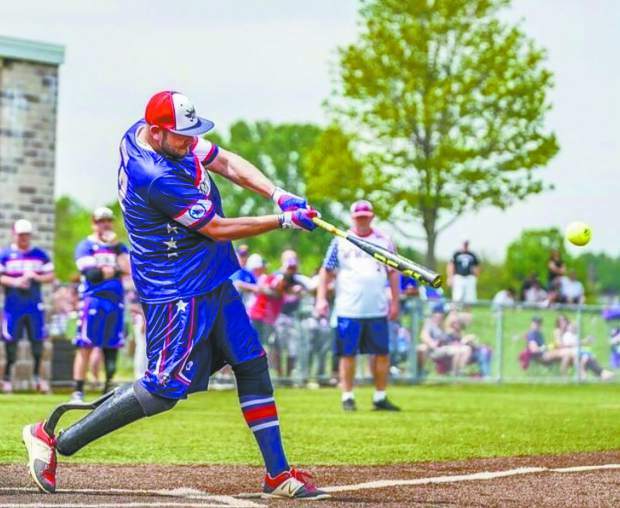 Despite his injuries, Rice is extremely involved in the Wounded Warriors Amputee Softball team, and in helping fellow veterans and children with physical disabilities. Rice is grateful for the generosity shown by Homes For Our Troops, as the new house will help him in nearly every aspect of his life.